=> 1978 – RICHARD FOSTER writes THE CELEBRATION OF DISCIPLINE. This book launched SPIRITUAL FORMATION into mainstream evangelicalism, and continues to be used today. In The Celebration of Discipline, (COD) Foster shares the practices of the Roman Catholic and Orthodox churches that originated with the DESERT MOTHERS and FATHERS. COD presents spiritual formation as attainable through the “spiritual disciplines.” These disciplines are seen as a means of growing in spiritual maturity and depth. “In fact, the implication was that without the use of these ANCIENT CONTEMPLATIVE methods true ‘spiritual formation’ was not possible.” Really ? ? ? => 1988 DALLS WILLARD a close associate of Richard Foster, writes The Spirit of the Disciplines. 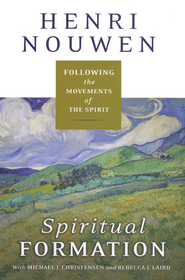 This book “reveals how the key to self-transformation resides in the practice of the spiritual disciplines, and how their practice affirms human life to the fullest.” The Spirit of the Disciplines is based on Willard’s understanding of Matt. 11:29–30. Willard teaches that the “yoke” spoken of by Jesus in this passage is to attempt to emulate the life of Christ in every way possible. Willard teaches that this emulation occurs through the practice of the disciplines. Present Day The ideas presented by Foster and Willard continue to be propagated through the works and teachings of others. Before Foster’s book, it is difficult to find references to spiritual formation in Protestant church history back to the Reformation – with a few exceptions such as the QUAKERS, ROMAN CATHOLIC & EASTERN ORTHODOX groups. Even though we can make words mean anything we want them to mean, words do have (proper) meaning. Words such as Spiritual Formation have meaning in the way they are defined and who defines them. Is the concept of spiritual formation biblical? If we define spiritual formation as being formed into the image of Christ as we meditate upon God’s Word, seek Him in prayer, and open our minds to the transforming power of the Holy Spirit, certainly it is biblical. But, it should be stated that the phrase “Spiritual Formation” is coming from an original background which introduces unbiblical concepts such as CONTEMPLATIVE PRAYER and MYSTICAL elements found eerily similar to EASTERN RELIGIONS with little to no biblical foundation. These concepts can be found historically practiced by the DESERT FATHERS. Many of whom were monks living separated from civilization following a monastic and isolated lifestyle while following ASCETIC, MONASTIC, and MYSTICAL practices. That is very concerning because of several potential problems not the least of which it promotes a departure from what the Bible teaches. They depart from biblical teaching, and instead mimic other non-Christian religious practices, and hold up EARLY CHURCH TRADITIONS (Roman Catholic monasticism) resulting in an approach that again, is not one which is taught by Jesus and the New Testament writers. If a teacher today promotes SPIRITUAL FORMATION, however he defines it, does he open up the possibility of pointing others to these non-biblical teachings (e.g. asceticism, Eastern mysticism,….etc.)? Yes. –> No matter how earnest the intention is, why would any teacher, author, pastor, disciple, Christian…etc., want to even bring up a phrase which historically represents these types of unbiblical teachings centered more on ancient monastic practices and Eastern mysticism rather than the Bible? The apostle Paul warns believers not to follow after popular philosophies based on the traditions of men and false teachings. He admonishes believers at Rome “not [to] be conformed to this world but [to] be transformed by the renewing of your mind” (Rom. 12:2). We will elaborate further in Part 4 on the similarities between what we commonly see today under the title “Spiritual Formation” and ancient Roman Catholic mysticism (& the Desert Fathers) along with Eastern Mysticism / Eastern Religions and the New Age. God Our Mother includes an apophatic contemplative meditation. Apophatic disciplines seek to push beyond language and rational thinking in the context of God’s Holiness, and can be very powerful. For this reason, we recommend that spiritual practices like apophaticism are best moderated through scripture, tradition, and some form of spiritual community. Wait…what in the world is Apophatic meditation? Glad you asked. Apophatic meditation is also known as Daoist meditation, which refers to the traditional meditative practices associated with the Chinese philosophy and religion of Daoism, including concentration, mindfulness, contemplation, and visualization. Techniques of Daoist meditation are historically interrelated with Buddhist meditation, and goes back to the 6th-century Daoists who developed meditation from Tiantai Buddhist anapanasati “mindfulness of breath” practices. Here is an Apophatic website explaining more. In other words, it involves the fine art of completely emptying your mind of everything, which is the goal of all “Christian” contemplative prayer practices promoted through Spiritual Formation leaders like Richard Foster and the late Dallas Willard. This is completely opposite of meditating on God’s Word and filling your mind with Scriptures as the Bible instructs us to do. Back to The Liturgists. Who are they? 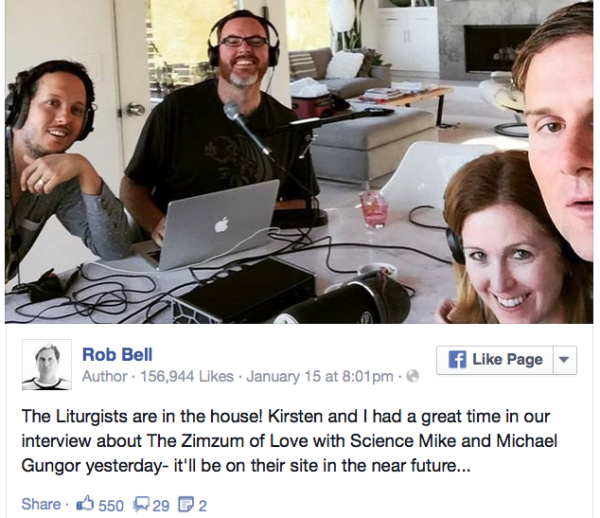 According to Bell’s website, they are a growing community of creatives that includes Luke Askelson, Andrew Arndt, Rob Bell, Amena Brown, The Brilliance, Rachel Held Evans, Gungor, Mike McHargue aka “Science Mike”, Nichole Nordeman, Aaron Purdy and Sleeping At Last. SELF-CENTERED FOCUS? SPIRITUAL FORMATION lingo spreading throughout Evangelical churches today. Where does the term come from and what does it mean? Unfortunately there is a great deal of confusion on what the phrase means. And unfortunately, many are just attaching any meaning they want to the phrase. A popular meaning has to do with discipleship. Is this what is meant by Spiritual Formation? Where is the first place to look for meaning and usage of a biblical concept? The Bible. Getting out the concordance and looking up “Spiritual Formation”, one finds how many applications of the phrase throughout Scripture?……………….0. Hmmm? A popular concept with no reference in Scripture. Well, you may say that the word “Trinity” is not in the Bible. But, the concept of what the Trinity is can be found throughout the Bible starting in Genesis. So, do we find the concept of Spiritual Formation throughout the Bible? Again, we need to know how the phrase has been used, its origin and what it has meant historically. Let us first understand that while some may view it as discipleship, the proper meaning of the phrase has to do with looking inward for spiritual growth by carrying out spiritual practices or disciplines that allow one do be intentional and focused on a deeper experience with God. These disciplines can include prayer, fasting, study of Scripture, confession, simplicity, solitude, silence…etc. There are many variations of this definition but most include descriptives such as – “deep”, “inward”, “experience”, “union with God”, “disciplines”, “transformation”, “empty yourself”, “meditation”...etc. The goal of being focused is to be open to listening to what God has to say to you. This is accomplished by emptying out your mind of any thoughts (BRENNAN MANNING says to not even think about God). Commonly described as Contemplative Prayer – Meditation is recommended which helps to accomplish this by measuring your breathing and/or repeating a word or phrase over and over again, i.e. a mantra. The words repeated may even be words taken from Scripture. But the repetition is meant to get your awareness to an alternative level of consciousness so that you can focus on this supposed union with God. => Silence is a crucial spiritual discipline for American Christians today. Contemporary life also makes it one of the most difficult to practice. Silence is, in every time and place, an essential way of breaking free from the grip of a world turned away from God and his kingdom—a world that neglects the soul. In our time in particular, the ever-present noise of modern existence and the overwhelming barrage of relent- less “communications” militate against living in divine presence. The discipline of silence consists in the practice of abstaining, for significant periods of time, from noise and from talking. We step aside from them to allow development of attitudes and habits that can constantly hold us, with thankful hearts, in the loving presence of God. Silence can be cultivated in many ways. For the novice, it is help- ful to experience a retreat center, where the practice of silence is understood and accommodated. Even in a retreat or escape, though, the aim is to establish silence in the soul, a nourishing and sustaining reality. Interesting the verses Willard uses doesn’t really address the concept of Silence. Many will also use PSALM 46:10. If the Bible doesn’t promote these forms of meditation or explains phrases such as “Spiritual Formation”, where do they come from. In many aspects they resemble much more closely practices from Eastern mysticism. They lead people to look within themselves for truth, rather than focusing on the Bible as our source of guidance. Apologists say that many are being duped into practicing Eastern forms of meditation in which you “empty yourself,” which could ultimately allow the devil to influence the mind. These so-called spiritual practices are unbiblical and dangerous. But there is a growing emphasis among many groups on increasing a focus on the “interior life,” which some apologists say could lead one astray. The Bible has nothing good to say about the heart of man. “The heart is deceitful above all things, and desperately wicked; who can know it?” (Jeremiah 17:9). Some people have said to me, “But the Bible talks about meditation.” That’s true. But when you study all the passages, you discover there is no recommendation to search within your heart for truth. Rather, you see an emphasis on meditating on God’s law (Psalm 1:2), on the works of God (Psalm 77:12), and on things that are true, noble, just, pure, lovely, and of good report (Philippians 4:8). When we seek some kind of emotional or even sensual (meaning a focus on our senses) experience with God in order to “feel” His presence as a way to confirm truth, we are starting down a pathway that eventually lead us away from God. We are even at risk when we allow another human to “guide” our meditation. This is not the example Jesus set for us. We need to mediate on God’s Word and on His works. It is always compare these activities with the solid Word of God. The spiritual formation movement is spreading rapidly throughout the Christian community. The concept of being formed spiritually is not wrong in itself, but many practices that accompany the movement miss the mark. Often, mystic rituals do not glorify the true God but can instead lead us into dangerous spritualism. What is Spiritual Formation? As Roger Oakland writes in his book Faith Undone, the term spiritual formation “suggests there are various ways and means to get closer to God and to emulate him. Thus the idea that if you do certain practices, you can be more like Jesus” (emphasis in original). Getting close to God and becoming more like Him are wonderful, Biblical goals (See Psalm 73:28 and Philippians 3:8-11). However, we must carefully choose the right means by which we seek a relationship with God. Oakland continues, “Rather than having an indwelling of the person of Jesus Christ and the Holy Spirit, spiritual formation through spiritual disciplines supposedly transforms the seeker by entering an altered realm of consciousness.” Lighthouse Trails calls spiritual formation a “channel through which contemplative prayer is entering the church.” Spiritual formation, then, can be seen as a way of seeking a relationship with God and a transformed inner self through the practice of spiritual—and often mystical—disciplines. Unfortunately, many earnest Christians and Christian leaders are entering into a spiritualistic lifestyle without even realizing it. Their desire to draw near to God is leading them to mystic and even occult rituals hidden among godly practices. In Part 3, we will look at how Spiritual Formation concept has been revived from the ancient mystics and who brought this practices into the contemporary church.